TALLAHASSEE, Fla. — Every summer, thousands of amateur scallopers flock to the warm coastal waters of Florida's Crystal River region, anchor their boats and reap the delicious bounty of the state's largest recreational bay scallop fishery. For these seasonal anglers, the toothsome morsels are well worth the two- or three-meter dive. But new research from scientists at Florida State University suggests that scallop harvesting — and recreational fishing generally — may come at a cost for the vulnerable sea turtles that live and forage in these shallow seas. "We found that during harvest season in the Crystal River recreational scallop fisheries, native sea turtle behavior changed in significant ways," said study co-author Mariana Fuentes, an assistant professor in the Department of Earth, Ocean and Atmospheric Science. "We need to continue this work to measure how severe these changes might be." Their research was published this month in the journal Oryx. The same agreeable conditions that make the northeastern Gulf of Mexico so suitable for scallop harvesting — temperate waters and lush beds of seagrass — also make the area a model habitat for green, Kemp's ridley and loggerhead sea turtles. That made the Crystal River region the perfect natural experiment for concerned researchers. "Our group strives to provide effective management options to reduce space-use conflicts between wildlife and human activities," Fuentes said. "It was a natural step to investigate the potential implications of these interactions and how to mitigate impacts." To assess the effects of the seasonal influx of recreational harvesters, the researchers set out to evaluate how marine turtle distribution and behavior might change in response to elevated boating activity. Using a sophisticated satellite tracking device, researchers tagged and monitored a selection of the three sea turtle species common to the area. They found that when boats appeared, the turtles turned tail. The arrival of harvest season saw turtle hotspots shift away from the congregated scalloping vessels and closer to the coast. "These human-driven shifts in the distribution of turtles may mean they're spending less time in areas that are likely to be of better quality, which could in turn affect their nutritional intake and energy budgets," said study lead author Natalie Wildermann, a postdoctoral researcher at FSU. 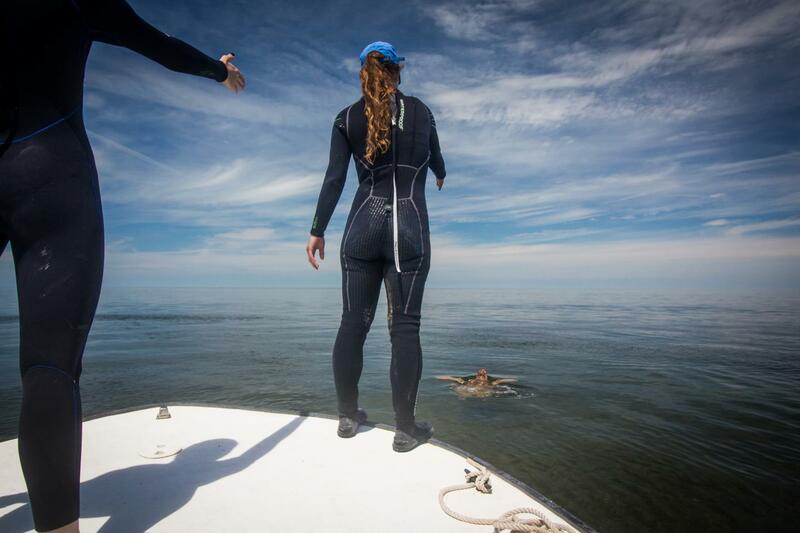 When forced to share limited space with fleets of scallop harvesters, Wildermann said, the turtles might need to expend greater effort in finding the food they need. Crowded waters could also breed increased competition among individual turtles for scarce resources. And then there's the basic environmental effects of the scalloper flotillas. "The thousands of vessels — and their oil leaks and chemicals — could have a considerable impact on the overall water and seagrass habitat in the region," Wildermann said. While a small navy of recreational fishing boats might not be the ideal neighbor for sea turtle communities, researchers stress that steps can be taken to minimize both direct and indirect ecological damage. Reducing the density of harvesters could allow turtles the room to migrate between better-suited habitats without being disrupted, and recording turtle sightings on GPS or smartphones could help boaters avoid areas with higher turtle activity. More rigid speed limits in areas populated by turtles are also advisable, researchers said, as the animals aren't typically nimble enough to avoid collisions with vessels traveling more than 2.2 knots (2.5 miles per hour). The trick, said Wildermann, is to craft policies that protect marine life without causing undue burden to well-meaning scallop harvesters. "We would need to work with scallopers and managers to find a balance between ensuring that scallopers can still enjoy the recreational activities, while minimizing the disturbance to marine turtles," she said. Former FSU research assistant Christian Gredzens and Christopher Sasso from the National Marine Fisheries Service also contributed to the study. The research was funded by the Florida Sea Turtle License Plate grant and the National Marine Fisheries Service.